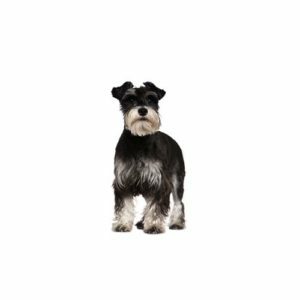 A medium-sized working breed, the Standard Schnauzer is sturdy and athletic, known for his arched eyebrows and bristly mustache and whiskers, the hallmark of the breed. Today, he can be seen in the conformation and performance rings and also serving as a therapy, service and search and rescue dog. The breeds harsh, wiry coat must be salt and pepper or black. The oldest of the three schnauzer breeds (and the prototype for the Giant and Miniature versions), the Standard Schnauzer originated in Germany. He guarded the family and livestock, rid the farmyard of vermin, and protected his owners as they traveled to market. The breeds name comes from the beard and moustache on his muzzle (“schnauze” in German). Sociable and affectionate, Standard Schnauzers become true members of their families and especially love children. Naturally protective, they will also alert members of the household to any potential danger. The breed is very intelligent but can be strong-willed, so its beneficial to start training early and provide daily opportunities for exercise. The Standard Schnauzers beard and leg hair should be brushed often to prevent mats from forming. The body coat should be “stripped” (loose, dead hair is plucked out) at least twice a year. Ranging in size from 17_ to 19_ inches tall at the shoulder. Are you interested in purchasing a Standard Schnauzer?